Ideal for foodservice operators looking to expand their range of grab-and-go foods for on-the-go consumers, new inserts transform the simple cold cup into a versatile container for a variety of snacks and meals. Available exclusively from BioMass Packaging, the cups, lids and inserts are made from a natural plastic derived from renewable, plant-based resources that biodegrade. BioMass Packaging's new crystal-clear cold cups and lids transform a regular cup into a versatile food packaging carry-all, giving foodservice operators endless possibilities. This attractive packaging solution delivers a really eye-catching food presentation — we think it’s going to be a huge hit with hotels, delis, coffee shops and supermarkets. BioMass Packaging®, a division of Excellent Packaging, an innovator and wholesale distributor of sustainable, biodegradable, and nature-based packaging for foodservice and other applications, has added modular, single-serve food containers, to its line of compostable foodservice solutions. 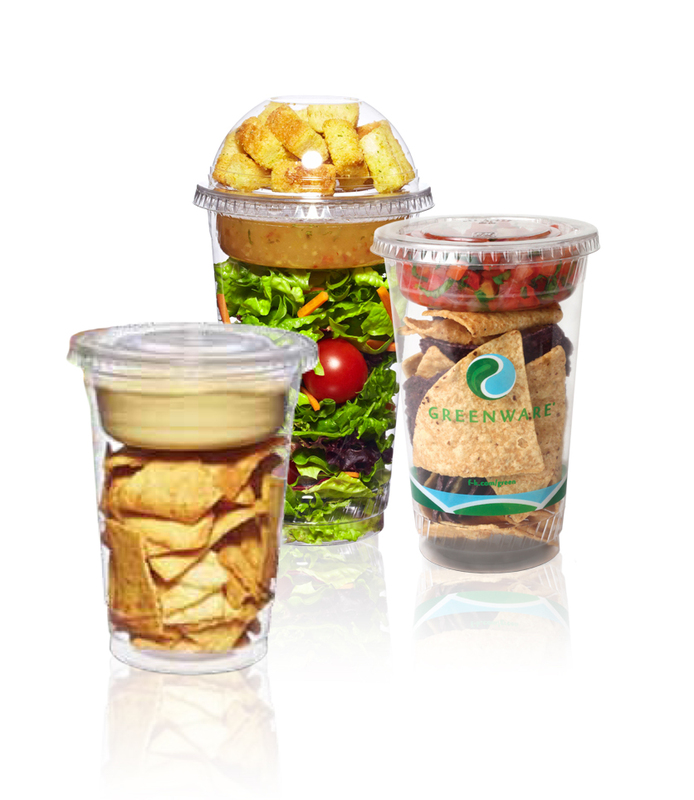 Made entirely from NatureWorks® Ingeo biopolymer — a PLA-based material — the new Greenware® crystal-clear cold cups and lids transform a regular cup into a versatile food packaging carry-all, giving foodservice operators endless possibilities for merchandising breakfast foods, lunch combos, and all-day snacks. Fresh and nutritious snack foods and small meals are increasingly popular with busy, on-the-go consumers, who expect to find appealing grab-and-go foods in their favorite coffee shop, convenience store, supermarket or hotel snack shop. 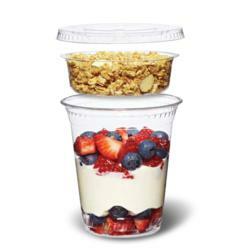 Snacks and meals such as parfait+granola+fruit combos, fruit+yogurt, chips+salsa, and salad+croutons+dressing, are now easy to package and present with BioMass Packaging’s modular system, which consists of a basic cup, an insert with a secure lid, and either a flat or domed lid that snaps on tight. ■ Compostable - every element of the packaging is made from plant-based Ingeo PLA plastic. The new Ingeo-based cups and inserts are sold in cases of 1,000 units and are available for immediate delivery. They can be ordered wholesale direct from Excellent Packaging or from the company’s BiomassPackagingStore.com online store. To learn more about the comprehensive range of bio-based, sustainable foodservice packaging products offered by Excellent Packaging, or to enquire about volume pricing, call (800) 317-2737 or email sales@excellentpackaging.com. A PDF-format brochure is available online: http://www.excellentpackaging.com/Sales/SalesPdfs/Greenware_CupInserts.pdf. The modular system can be used to present foods that need to be combined just before eating, in a convenient, sustainable, nature-based package. Download the crystal-clear cups and inserts brochure.